It was the bottom of the ninth inning at the Polo Grounds in New York on 3 October 1951. The Giants trailed the Dodgers 4-1. Alvin Dark and Don Mueller each got on base with singles to start the inning. Monte Irvin fouled out. Whitey Lockman hit a double to drive in Dark and send Mueller to third. Mueller, however, hurt his ankle sliding into the base and was replaced by a pinch runner, Clint Hartung. With two runners in scoring position, only one out in the inning, and the scoreboard now reading 4-2, Dodgers manager Charlie Dressen decides to replace pitcher Don Newcombe with Ralph Branca. The rivalry between the Giants and the Dodgers had been an intense battle for the hearts of the fans of New York. It was also a rivalry that had been broadcast across the country, through television and radio. The Giants had trailed the Dodgers by 13.5 games in August, and yet managed to tie them on the last day of the season by going 37-7 in their remaining games. The tie resulted in the three-game playoff that would determine who would advance to the World Series. The teams split the first two games of the series, 1-1. It all came down to Game 3. “I wanted to say it was a cheap Polo Grounds home run. I wanted to say that in any other ballpark it’d be an easy out. I wanted to believe that I was dreaming. I didn’t want to believe that it was really happening. I wanted the pitch back. “But the ball was gone and the game was over. The series was over. The pennant was lost. Unfortunately for the Giants, the magic wouldn’t be enough to sustain them through the World Series. They would lose the championship to the New York Yankees in six games. Nevertheless, “the shot heard ’round the world” is a moment that remains embedded in the heart of American culture. In 1999, the United States Postal Service issued a commemorative stamp celebrating Thomson’s homer. In ESPN’s SportsCentury, the moment ranked #2 in the list of the Ten Greatest Games of the 20th Century (behind the 1958 NFL Championship game between the Baltimore Colts and the New York Giants). Branca, Ralph. A Moment in Time: An American Story of Baseball, Heartbreak, and Grace. New York: Scribner, 2011. Goldstein, Richard. 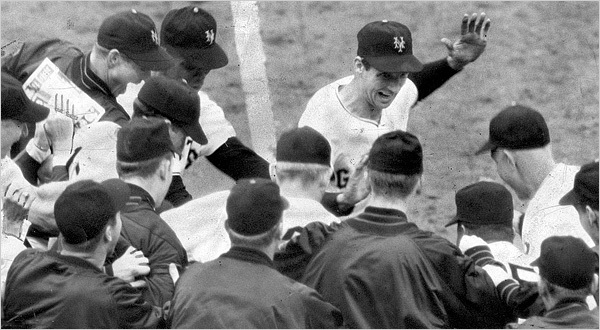 “Bobby Thomson Dies at 86; Hit Epic Home Run.” New York Times 18 August 2010, New York ed. : A16. MacCambridge, Michael, ed. ESPN SportsCentury. New York: Hyperion ESPN Books, 1999. On 27 April 1971, Hank Aaron hit a 350-foot home run off pitcher Gaylord Perry. It was the 600th homer of his career, making him only the third player in baseball history to accomplish this feat, behind Babe Ruth and Willie Mays. In spite of the homer, Atlanta lost to the Giants 6-5 in ten innings. Ironically, it was Willie Mays’ tenth inning single that produced the Giants’ winning run. On 25 April 1901, the American League opener was played at Bennett Park in Detroit. Going into the bottom of the ninth, the Tigers trailed Milwaukee 13-4. Astonishingly, Detroit scored ten runs to come back and win 14-13. Baseball breaks your heart. It is designed to break your heart. The game begins in spring, when everything else begins again, and it blossoms in the summer, filling the afternoons and evenings, and then as soon as the chill rains come, it stops and leaves you to face the fall alone. Here’s a clip I found that is simultaneously amusing and disturbing. I suppose it goes to show the power and influence of the game of baseball, even in its earliest years. The story originally printed in the New York Times on 23 September 1891. For a larger version of the article, see the file in the New York Times archives here. On 22 April 1970, during the pregame ceremony, New York Mets pitcher Tom Seaver was presented with the 1969 Cy Young award. In the game that followed, Seaver struck out a record ten consecutive batters as he led the Mets to a 2-1 victory over the San Diego Padres. He struck out nineteen total hitters over the course of the game, which tied another Major League record. Even better, four of those batters struck out looking. I guess Seaver didn’t want to leave any doubt that he really did deserve that Cy Young, eh?